Scholarships have become part of the fabric at Grand Canyon University, a thread that starts with the family-transforming Students Inspiring Students initiative and winds across the student body. But whether large or small, scholarships make a difference – and not just for the students and their parents. Sometimes, they can change the extended family, too. That bit of inspiration was part of the story in the Colangelo College of Business when its Accounting advisory board awarded two $1,500 scholarships, provided by firms in that group, to master’s students Meghan Metzger and Carlos Canchola. They have accomplished a lot already. Both received their bachelor’s degrees in Accounting from GCU. Both are working at local firms – Canchola as a staff accountant at Shasta Pools & Spas, Metzger as a tax associate at Henry+Horne – in addition to coming to campus for their master’s cohorts and doing the required work toward that even more prestigious second degree. But Canchola is a shining light in another way: He’s the first member of his family to attend college – or even junior college. His undergrad diploma last April set off a chain reaction. “After I graduated from Grand Canyon my uncle said, ‘Hopefully this can set an example for your cousins (in high school),’” Canchola said. Most notable was a cousin who was going to a trade school to become a mechanic. Canchola realizes that easily could have been him. An earlier scholarship enabled him to attend GCU after he got his associate degree from GateWay Community College. “I’m glad I got the scholarship here because I really like it with the Christian culture,” he said. And once he got his bachelor’s, he thought, “Why stop there?” His next stop after obtaining his master’s is the Certified Public Accountant exam. Metzger graduated from GCU in 3½ years, finishing in time for commencement in April 2017. Like Canchola, she has accomplished a lot – she was president of GCU’s chapter in Delta Mu Delta, the international business honor society, and here’s maybe the most amazing part of all: She loves, loves, loves doing taxes. And what’s the most challenging part of what she does, amid all that love for it? Like Canchola, Metzger is eager to take the CPA exam, only she’s further along because she got her bachelor’s a year earlier: She’s due to finish her master’s work in mid-March. 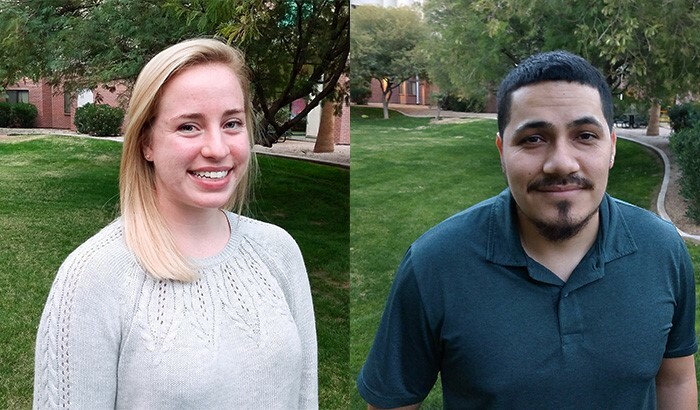 The two scholarship recipients have something else in common: They both are former undergrad students of Dr. Kelly Damron, GCU’s accounting instructor extraordinaire. (Read more about her in this GCU Today story.) Not surprisingly, both speak highly of the experience. Damron emphasized that the accounting faculty simply tries to encourage students to pursue the career that is best for them. So what’s next for these two students? Metzger said the scholarship will enable her to be debt-free when she’s done with school. Canchola said it will enable him to pay the bills while he continues his education. There’s that CPA exam looming and then, if all goes according to plan, a career in the field. For Canchola, that means a dream of running his own tax firm in south Phoenix someday. “I believe that things happen for a reason,” he said. At GCU, scholarships can be the reason to pursue higher education – for entire families.